After attending Trimble’s in.sight conference in Houston this week, it was abundantly clear that Trimble places tremendous importance on the need to engage its customer base, prospects, strategic partners, employees and key stakeholders. This 3-day event featured a plethora of companies in transportation and logistics that showcased the latest and greatest technologies, products and services. TMSA also hosted a booth and held focus group among non-members to better understand potential ways the association could better serve the educational and networking needs of marketing and sales professionals in the industry. I was honored to facilitate an educational session that highlighted best practices and emerging trends in marketing and sales. Mark Southey, Executive Vice President of Business Development for TRAFFIX (and 2018 TMSA Sales Executive of the Year), along with Caroline Lyle, Vice President of Marketing at TMW, were on the executive panel. With 2,000-plus attendees, hundreds of educational sessions, and a comprehensive expo, this experience was a great reminder to me of the importance of an event strategy to accomplish your business goals. Trimble has acquired some of the biggest names in trucking technology in the past few years – and nearly all are TMSA members. It quickly became clear at the in.sight conference this week that this global enterprise continues to take steps to fully integrate these brands - including PeopleNet, TMW Systems, ALK Technologies and 10-4 Systems, to create an end-to-end technology platform. Trimble’s platform includes TMW, a provider of software, business intelligence solutions to the transportation industry; PeopleNet, a provider of fleet mobility technology; 10-4 Systems, a supply chain data aggregation company; and ALK, a commercial routing and mapping company. Through this family of brands, Trimble offers an open, scalable platform that is focused the transportation market (and others). In fact, this was a major theme by top Trimble executives during the opening session on Monday morning. The entire conference was packed with opportunities to encourage conversation among everyone who is part of the Trimble universe – customers, strategic partners, prospects, top management, employees, etc. 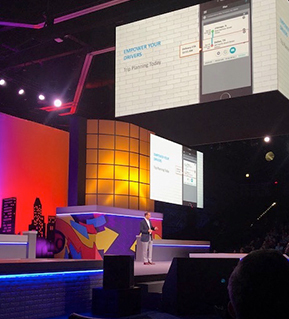 General sessions featured an amazing stage where marquee presenters and top management of Trimble shared vision, inspiration, and market intelligence. Within the expo hall there were in.sight LABs where you could see product demonstrations and have meetings with subject matter experts. And of course, lots of laughs and fun were to be had over adult beverages at networking receptions and customer outings – including a night at the incredible Minute Maid Park (home to the Houston Astros), a facility that can hold 40,000+ attendees of baseball games and special events. LeLand Melvin is an incredible example of how one can face and overcome life’s challenges. During his closing keynote at the conference, he shared his unique story of perseverance. Tragically while with NASA, Melvin lost his hearing during a training exercise, with emergency surgery resulting in only partial recovery of his hearing. In spite of this setback, he was able to ultimately travel off-planet twice on Space Shuttle Atlantis to help build the International Space Station. Before becoming an astronaut, Melvin was drafted by the Detroit Lions in the 1986 NFL Draft. Although a hamstring injury cut his NFL career short, Melvin holds the distinction of being the only person drafted into the NFL to have also flown in space. Whether it's a major 3-day conference such as this or simple a customer or employee appreciation dinner one evening, never underestimate the power of live, planned, strategic interaction that is designed to engage your key stakeholders! If you're looking for more best practices and examples of this specifically in the transportation and logistics industry, you can find them in the Best Practices Library in the Members Only section of the TMSA website. Comments on "How to Engage Your Customer Base: Observations of Trimble in.sight Conference This Week"